All you really need to get off the ground is a paramotor and a wing! But there's a few things that every pilot should have to make flying safer and more enjoyable. In this post we'll look at the top 13 essentials that you'll need before you can begin flying. There's a few things you'll need to protect your equipment from damage in flight and during transport. And some gear to keep you safe in the air and on the ground. This list contains all of the paramotoring equipment you'll need along with some recommendations based on the gear that I use. When you've finished here you'll want to check out > THIS POST < to find out all of the essential paramotoring equipment you'll need to pack into your kit bag when you go flying. 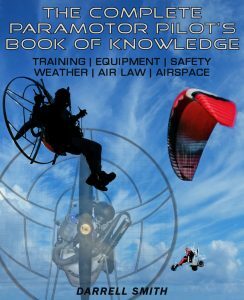 Obviously you'll need a paramotor and wing, but I've got a couple of essential guides to help you find exactly what you need. Firstly, check out this > THIS GUIDE < which will teach you all about wings and answer all of your questions. You'll learn exactly what ratings mean and what weight range you'll need. You'll also learn about reflex wings, buying used wings, and a whole lot more. 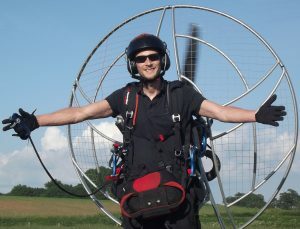 Then you can > GO HERE < to learn all about buying your first paramotor. The guide goes over everything you'll need to consider, there's a lot more to a paramotor than you realise. And contrary to what most new pilots believe, paramotors aren't all the same; there's a ton of differences between brands! We don't need to use many instruments when paramotoring, but pilots flying long distances, or those who fly near to airspace restrictions will definitely find them useful. I've got a whole post containing the top 7 choices, from altimeters and digital compasses, to purpose built aviation GPS units. Check out the list by clicking HERE. This is an important piece of paramotoring equipment for beginners and seasoned pilots alike. If you're just starting out you'll need to do hours of kiting before you even think about flying a paramotor. Even after you've flown it's important to keep up your ground handling skills and ensure your launches are on point; this ensures you won't make any launch mistakes which could damage your equipment. 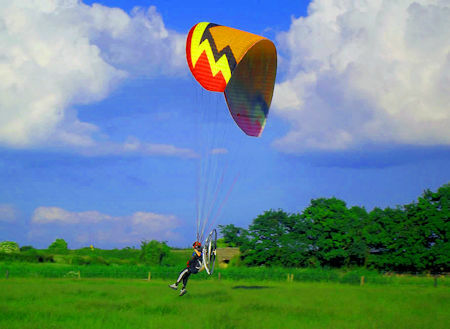 If you're into a bit of free flying your paragliding harness will work perfectly for kiting. You can find old paragliding harnesses for sale on second hand sites, or better still, get yourself a kiting harness. Kiting harnesses are for ground handling only and can't be flown, but they're great for learning and keeping up your skills. You can get this top rated one at a great price on Amazon > KitingHarness. It doesn't come with locking carabiners so don't forget to add some to your cart. Never fly without a helmet, people have died from being dragged along by their wing and dumped onto hard ground! A helmet is essential paramotoring equipment that'll also protect you from trips and falls during launching and landing. Read my full helmet guide with the top 5 choices by clicking HERE. You've got a few choices depending on the type of flying you'll be doing. The first choice is a helmet with a built in headset like this one on Amazon > HelmetHeadset. This is recommended if you will be flying with other paramotorists, for example at fly-ins, or even with friends. Communicating with each other in the air is super important, and also fun. You'll be able to attach it to a radio, walkie-talkie, or bluetooth intercom. The second and much cheaper option is a helmet like this one on Amazon > PPGhelmet. This is a super popular choice for paramotorists. You'll be able to attach a pair of Cap-Mount Earmuffs which you can also find on Amazon to protect your hearing. 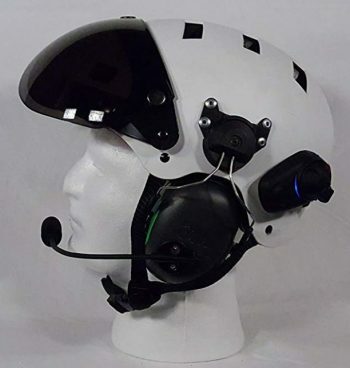 This is a good option for people that won't be flying / communicating with others in the air. Or you could easily adapt it by fitting an intercom. Your third choice is a helmet without a radio that has earmuffs built in. I use the Icaro 2000 solar X. These are expensive, so option two is better for people on a budget, and you won't notice any difference in the air. With any of these choices you can also adapt the helmet for bluetooth communication by fitting this nifty little device from Sena > Sena Bluetooth. If you're interested in vlogging or simply making great videos with live comms, you can also link the Sena up to your phone, or your GoPro to record your voice! How cool is that? The final option I will recommend is the purpose built helmet pictured above with the Sena Bluetooth already installed. This setup uses the 'Sena Ride' hooked up and ready to go. You can take phone calls, listen to music, and most importantly communicate with other pilots. CLICK HERE to find out more about this helmet on Amazon. Winter flying is awesome! It brings some of the smoothest air you'll ever fly, but it gets very cold. If you're living in a cold country or any country where your temperatures drop below about 10 °C you'll need some good gloves. For every 1000 FT you climb, the temperature will drop by 3 °C. Then you have the wind chill and the air that's being pulled past you by the propeller, this makes your fingers super cold. I've landed during the winter with painfully cold hands, even while wearing thick skiing gloves. If you're only doing quick low altitude flights in temperatures over about 6 °C you might get away with a good pair of ski gloves. But any more than a 15 minute flight will require heated gloves. I've been through a lot of heated gloves, there are some really rubbish gloves out there. Be aware that cheap heated gloves are cheap for a reason, and they'll be useless for paramotoring. With cold hands it's really hard to enjoy your flight, for me heated gloves are another piece of essential paramotoring equipment. Spend a bit of money on some decent heated gloves that will last you many winters like the ones I use, available here on Amazon > HeatedGloves. These gloves heat your hands and fingers and the batteries last over 2 hours, so plenty of time for a few winter cross country flights. You'll be able to enjoy winter paramotoring without having to land after 15 minutes because of the pain of frost bitten fingers. Whether you're flying mid winter or mid summer, a flight suit is the best paramotoring purchase you can make. I flew for about 2.5 years using a ski jacket to keep me warm until I was given a flight suit by a local microlight pilot. The flight suit made a massive difference, and it's a lot more comfortable in flight. Choose a flight suit that's easy to run in when launching and landing; and find one that has lots of pockets, these come in really handy for cross country flights. If you're flying during the cold winter months it's also a good idea to get a bikers balaclava. This will protect your face and lips from the cold air that you'll have to endure. I've ridden motorcycles at speed in some of the coldest weather, but there's nothing quite like the cold you experience during winter paramotoring. With your heated gloves, flight suit, and balaclava you'll be well protected. We spoke about airspace maps in > this article; and if you're going to be flying anywhere near any airspace you'll need an altimeter. You may be required to fly above or below certain altitudes and guess work is never good. There are plenty of other reasons for having an altimeter, like sticking to the 500 FT rule for example. I use the Fairhaven micro alti pictured above; it straps to your wrist or your risers and is made specifically for paramotoring and paragliding. 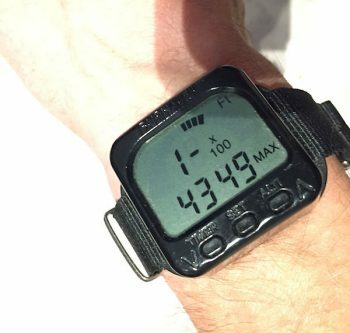 There's an altimeter, vario, G-meter, watch, thermometer, and more. I mainly use it for the altimeter which is very accurate, but the G-meter is really fun to play with. I've owned mine for three years now and it's still going strong! These are also great if you like a spot of free flying, the vario is really loud and very sensitive. Of course you may not want the vario for paramotoring so you can easily silence it with a simple slide switch on the side. You can find out more about the micro alti or view the current price here on Amazon > MicroAltimeter. You can launch without a windsock, but the wind will usually change before you land. If you don't know what direction the wind is coming from you could end up landing downwind and very fast! This could lead to broken props, bent cages, and I've even seen people with broken body parts! Get yourself a small windsock as a larger one will not move in the light winds we fly paramotors in. You can also get streamers which detect even lighter winds for those really calm morning flights. Get a 5 - 10 meter pole to attach it to and a ground stake so you can place it anywhere you like in the field. Paramotors are super hard to spot out in the air, especially for fast moving planes. There have been multiple near misses because of this and that's why I recommend that all pilots fly with a strobe to help keep them safe. I highly recommend that you check out >this post< for 2 of the best and to learn why they're so important. Or you can go straight to eBay and get yours HERE. Whether you leave your propeller on the paramotor or remove it for transportation, you'll need some propeller covers. Propellers can very easily take a knock while loading up or during transport, and they chip easily, especially wooden props. A repair job isn't cheap, and a new carbon propeller will cost you hundreds to replace. fitting a good set of prop covers will protect your expensive propeller from damage and could save you a lot of money. I encourage every pilot to fly with a reserve parachute, this is your lifeline that could save your life. Believe it or not, I've actually flown with many pilots that don't carry a reserve! Their argument is always something like, "You're already flying a parachute, why would you want another?" Or it might be, " I don't fly high enough to need a reserve, it wouldn't have time to open if I ever threw it anyway". This is just crazy! You only need to look at a few recent incidents to realise how important a reserve parachute is. In the last 6 months alone I've seen reports and videos of mid air collisions, drones and birds stuck in lines, and near misses with fast moving aircraft. If a plane comes along and chops up your wing with its propeller you'll need a reserve, so buy one before flying. Since day one I've flown with a front mount reserve, some say that they get in the way, but I've never had a problem. You can also get under seat reserves, side mount reserves (harness pocket), or an overhead reserve. These are all very cool, but I opted for the option that is the easiest to see and reach if you need it quickly. When buying a reserve check the all up weight range and match it to yourself + paramotor + all of your gear. Fit it to your paramotor and leave it there so it's never forgotten. Have it repacked once per year to ensure it will open easily in the unlikely event that you need it, then fit it straight back onto your paramotor. This isn't really paramotoring equipment but still something that comes in super handy. You'll most certainly need weather apps, but you can also get airspace apps, tracking apps, and more. I've got a whole list of the best apps that you can get right now. Some are free to download, the rest are really cheap, but still awesome. Check out the list of the top 5 choices HERE. And that just about covers all of the paramotoring equipment you'll need. These recommendations will help you to stay safe, protect yourself and your equipment, and have some serious fun! Don't forget to take a look at the linked article at the top as there are some important items that you'll definitely need in your kit bag. Hi, I’m looking to get into paramotoring and had a question about the kiting harness. Does it come with a wing that you practice with (it’s not clear on that in the description). Was thinking of buying it to practice with before I buy a lot of other stuff. Thanks for all the good info here. Much obliged! Hi Andrew, the kiting harness doesn’t come with a wing. If you buy the harness you’ve got a few options..
(1) You can buy a training wing which is much smaller than a regular paramotoring wing. These are usually 12 meters as opposed to a regular wing that could be up to 29 meters and more difficult to ground handle in light winds. These are great for learning but they can’t be flown and they can be expensive. (2) Save some money and get an old wing that’s no longer flyable just to learn with. This is probably the best option as you’ll be dragging it across the floor, Inflating, deflating, and putting large amounts of mechanical stress on the wing.. Ground handling is important, but if you do a lot of it, it’s best to practice on an old, less important wing. (3) Buy a new wing, or a good flyable second hand wing that you will eventually fly. This is what I did, but I’d already done a lot of ground handling on school wings so I never put that much added stress on the wing.